Objectives: Design container packing protocols and coffee bags which allow for maximum preservation of the original cup profile of High Value Green Coffees’ (HVGC). limit air movement to the coffee at all times prior to roasting. Traditional Bag sizes are needed due to the fact that most HVGC is produced and used in very small quantities, and roasted over several months time. Many times it is also distributed to a number of micro-roasters in the destination country. Due to economic and logistic barriers the majority of HVCG will continue to be transported in traditional non-refrigerated containers with extended freight times and will be exposed to a variety of non-controllable environments. Ideal storage temperature for coffee is 15 degrees Celsius. Coffee dried between 11-12% moisture content will maintain stable in an ambient RH of 65%. Coffee looses (when drying) or gains (when wetting) taste with each fluctuation of its moisture content. Rapid (how fast?) changes increase the rate of taste change. Coffee will sweat less when the temperature changes are minimized and slowed down. 1. Rapid temperature changes occur within and outside the containers while in transit. This creates sweating of the coffee and condensation of the free water in the air. 2. 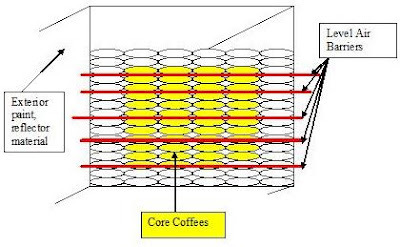 The container shell conducts and radiates heat (as well as extracts heat, cools) to the coffee contacting the walls on the inside, and the top level of coffee. This causes the coffee in contact to sweat (or in the case of cooling provide a surface for condensation together with the metal walls). 3. Relative Humidity of the external environment filters into the container. This is a problem when the RH is excessively greater or less than 65%; causing the coffee to increase or loose moisture content. 4. Internal Paint Odors can contaminate coffee. 5. Leaky containers/holes in containers allow water to ruin coffee. 1. Wrap the interior with traditional paper and card board as a moisture absorbent. 4. Choose/request only white or light colored exterior painted containers to increase light reflection and reduce heat absorption. This is especially important if the coffee will be transported to final destination during the destination summer weather, and is amplified if the container will be going distances by train or truck. 6. Plug all ventilation holes to prevent RH fluctuations. Once the internal free air is absorbed by the coffee the air will level out to 65% at 15 degrees C (or close) RH. 7. Create air barriers within the container to limit air movement, and water condensation. (Ie 6 levels rather than open). Plastic sheets. This reduces the free water movement to roof space ratio. In other words, in a non-multi-leveled container the majority of the free water in the heated air rises to the roof of the container and then condenses. Breaking that into several roofs levels would mean less condensation per square inch of roof space, spreading out the condensation into 6 groups, and reducing or spreading condensation damage (less concentrated). 8. Coffee positions. Place HVGC only in core of the container. (Core=no contact with side, bottom, top or ends of the container) This uses the surrounding exterior bags as a temperature thermal barrier. (ie the last place for temperature and air change is in the center of the stacked container) This core could even be wrapped with a plastic sheet forming a cocoon within the core of the container. 1. Rapid Aging of coffee due to Oxygen/Air contact and movement. 2. Open air structure of the bags allows air contaminants contact with coffee (fork lift exhaust, warehouse dust, container interior paint odors). 3. Burlap contaminate with coffee (oils from burlap manufactures; Physical and odor). 4. Ink on the burlap bags (printed logos, tattoo of export codes) seeps through can contaminate bags (Physical and odor). 6. Northern hemisphere weather can allow the coffee to freeze (Possibly causing damage when repeatedly thawed and frozen). This is possibly a problem when coffee is transported by plane due to the high altitude temperatures. 7. Burlap is conducive to absorbing moisture and providing a habitat for spores and molds to grow. 1. Craft paper insert inside of traditional burlap bags and sewn shut; Multi-layer paper bags. (Rice or flour bags) This would allow coffee to breath and sweat, but would lessen the air/coffee contact and movement. It is very inexpensive and easy for customs to do checks. In the case that the bags are check with the traditional stabbing technique the burlap will close up and prevent the coffee from spilling. 2. Poly Bag inside of traditional burlap sewn shut. Similar to the paper insert, but this will provide an almost air tight close. Minimal seepage. 4. Nit Plastic outside of burlap. This would slow moisture fluctuations. 5. Wooden boxes/drums. The wood provides an absorbent in the case of coffee sweat, and is also a thermal barrier amplifying the heating/cooling time of the coffee inside. 6. 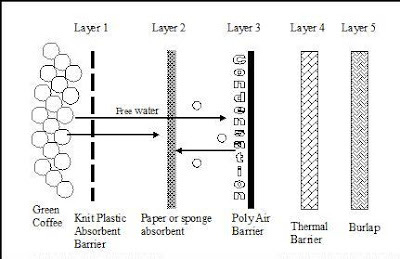 Poly Bag inside of a rubber or thermal layer outside (wet suit, Styrofoam, rubber sleeping pad foam, plastic bubble wrap?). Create a thermal bag which is Poly on the inside to prevent air movement, and has a thermal element on the outside to reduce the temperature changing issues . . . and correspondent the sweating and condensing problems. 7. 5 Layer Bags. Innermost layer a Poly knit bag which allows free water to move with the air. Since heated air, which carries the most moisture, rises it will rise to the vertically highest point. In this case passing through the innermost layer, through the absorbent layer and then condense as it hits the air barrier. The absorbent than can take in the condensation, but not be in direct contact with the coffee, preventing green coffee damage. 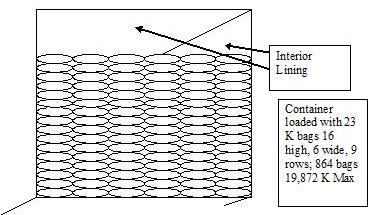 The thermal outer layer (layer 4) will reduce the changes of the inner temperature. The outer burlap layer will protect the inner layers from puncture and in the case of customs stabbing will limit beans from being lost due to holes. The absorbent material would also allow the coffee to slowly reabsorb the moisture as the internal bag RH Balances out. 8. Size of bags. Using 23 Kilo bags further divides up the levels of coffee, creating up to 16 vertical barrier levels within the container, vs the one open system in the traditional model. This is the same idea as breaking the container up into 6 levels. 9. Vacuum seal Poly bags. Advantage is less air, less RH to coffee ratio. 10. Vacuum seal and nitrogen flush sealed poly bags. 1. Condensation: If sweating and condensation occurs it will almost certainly ruin the coffee in enclosed bags; while traditional burlap’s breath-ability limits the impacts. 2. Customs: Coffee is a highly checked product and is traditionally checked by customs through the stabbing method. This breaks the barrier intended. Unconventional packaging (especially air tight sealed) is also flag for customs; which will increase the chance of customs delays and costs. Drug Dogs might not be able to effectively sniff the packages and the Customs could decide to pull the entire container. 3. Costs: The cost of design, testing and initial manufacture is high. 1. Coffee dried to 11% will take in the RH moisture and balance out at 65% RH and 12% Moisture content. 2. In smaller packages the condensation quantity is reduced per square inch of vertically high points when laid flat. 3. Greatest temperature danger is in transit of Container via Rail and or truck in destination country. Temperature reduction to under 30 degrees C, (?) rather than accepted 50+ C (?) with insulated containers. 4. In the case of a damaged container (hole) in route to delivery the coffee packaging itself is water proof from outside contaminates. This would also apply to transit in loading and unloading. What is the rate of temperature increase (Time/temp+) in which coffee sweating is inevitable? What is the rate of temperature decrease (Time/temp-) in which dewing/condensation is inevitable? What is the maximum temperature coffee can gradually (Time/Temp+?) rise to without sweating? What is the ambient temperature in which coffee begins to freeze? What material best slows the rate of temperature change, is flexible, less than ½ inch thick and economical? Do shipping lines and customs allow external manipulation of a container to reduce the suns heating of the container? Does limiting ventilation to the coffee cause damage? If the coffee has some level of life does this give off CO2 which could cause quality damage if it doesn’t escape away from the bean?